Akshay Karnewar is an Indian cricketer who plays for Vidarbha. He made his List A debut on 10 December in the year 2015-16 for Vijay Hazare Trophy. 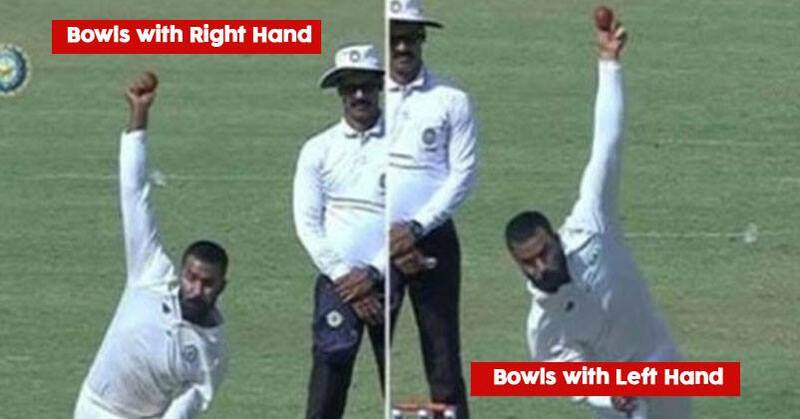 “Right-arm off-spin” said Akshay Karnewar, informing the umpire, just as he was about to bowl. Nothing unusual about that you would think. But the umpire was a little taken aback. Karnewar was bowling left-arm spin. The umpire informs the batsman that the same bowler is about to change his bowling arm and bowl right arm off spin. That’s what happened on Day 1 of the ongoing Irani Cup in Nagpur. Akshay Karnewar’s skill was on full display in the matches he has played so far as he kept altering his arm to adjust to different handed batsmen, much to the amazement of everyone witnessing. He's ambidextrous. Bowls left arm spin and right arm off spin.